Some 300 members of the Palestinian Fatah faction, headed by Palestinian Authority (PA) President Mahmoud Abbas, have begun receiving “military training” in the Gaza Strip in preparation for war with Israel. The Nidal Academy was named for Nidal Al-Amoudi, a top Fatah militant killed by the Israel Defense Forces on January 13, 2008, after he carried out a series of armed attacks against Israeli civilians and soldiers during the Second Intifada. “The academy has been named after the commander Nidal Al-Amoudi (Abu Hussein) to fulfill his dream of qualifying the fighters militarily, morally, religiously and revolutionarily,” explained a statement released by the Fatah armed group. Noting that some 300 “fighters” have already joined the academy, the group said that they have begun undergoing training in various methods of warfare. “We have pledged to prepare an army of fighters by devoting our full abilities and energies to consolidate the option of armed struggle as the only means to liberate Palestine,” the group declared. The Martyr Nidal Al-Amoudi Division is one of several Fatah-affiliated militias that continue to operate in the Gaza Strip despite Hamas’s violent takeover of the area in the summer of 2007. These groups pose no threat to the Hamas regime, which is why they are allowed to operate freely in different parts of the Gaza Strip. The groups’ explicit policy is to prepare for war with Israel and launch terror attacks against Israelis. Hamas, however, which expelled their leaders from the Gaza Strip and continues to persecute dozens of Fatah activists in the Gaza Strip, is not on their hit list. The Fatah-affiliated militia inauguration of its own “military” academy in the Gaza Strip is a novel move. In recent years, Fatah armed groups have posted videos of their men undergoing military training orchards and fields, far from the watchful eyes of their rivals in Hamas. Now it seems that Hamas has nothing to fear from the Fatah militants, as Israel is the sole target. Fortunately for Hamas, the Fatah militias are rather preoccupied with internecine struggles. This leaves precious little time to think about ways of improving their people’s lives. Make no mistake. These groups believe that they represent the real Fatah, the one that never recognized Israel’s right to exist and holds on to armed struggle as the only way to “liberate Palestine.” They are not breakaway groups. That is why they continue to operate under the name of Fatah. In their view, they are following the principles of their former leader, Yasser Arafat, who launched Fatah as a “national liberation movement” and never truly abandoned the option of an armed struggle against Israel. 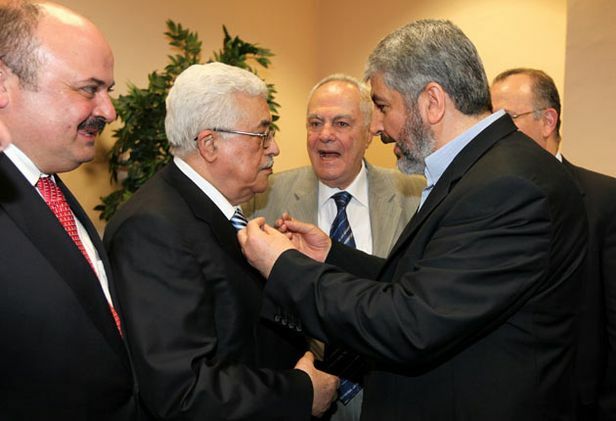 It is Abbas and his colleagues in Fatah, they say, who have deviated from Fatah’s doctrine and true goals. The power play among Fatah militias in the Gaza Strip reflects the wider division among Fatah’s political leaders. According to Palestinian sources, Fatah leaders in the Gaza Strip have truly become disassociated from the faction’s leadership in the West Bank. Abbas’s aides blame exiled Fatah strongman Mohammed Dahlan for the schism, claiming that he provides dissenting Fatah officials with money, in an attempt to undermine the Palestinian president, who is also head of Fatah. Abbas recently summoned Fatah leaders from the Gaza Strip to an emergency meeting in Ramallah to discuss Dahlan’s growing influence in the Gaza Strip and the rifts in Fatah. The move came after thousands of Fatah members who are loyal to Dahlan staged a large demonstration in the Gaza Strip against Abbas. During the protest, they burned and trampled on pictures of Abbas. Such developments in Fatah are notable for a specific reason: by and large, the international community continues to perceive Fatah as the “moderate” Palestinian party with whom Israel should make peace. Yet Fatah is far from a single united bloc; many groups within the faction, in their own words, continue to seek the “liberation of Palestine” through armed struggle. Moreover, neither Abbas nor any of his senior Fatah loyalists in the West Bank have repudiated the war-set Fatah militias. Crucially, many of these Fatah militiamen continue to receive salaries from the Palestinian Authority. Fatah is, in fact, a two-faced hydra; one face tells the English-speaking international community what it wants to hear, namely, that it supports a two-state solution and seeks a peaceful settlement to the conflict with Israel, while the other tells the truth: it is committed to an armed struggle and the “liberation of Palestine” and is even preparing for war with Israel. Worth noting as well is that some of these Fatah militias also continue to operate in some parts of those territories controlled by Abbas’s security forces in the West Bank. And like their cohorts in the Gaza Strip, they too receive salaries from the Palestinian Authority. Abbas has lost the Gaza Strip not only to Hamas, but also to his own erstwhile Fatah supporters, who are marching in a totally different direction from the Fatah leadership in the West Bank. The dispute between Fatah and Hamas, which has effectively split the Palestinians into two entities, one in the West Bank and the other in the Gaza Strip, is one reason Palestinians are farther than ever from achieving an independent Palestinian state. The infighting in Fatah and the gulf separating its leaders is another. Abbas’s claim to sole Fatah leadership is hardly credible to even the most credulous of Abbas backers: thousands of his “fighters” are preparing for war with Israel.